The colour is old gold and the nose offers the bold fruity-honeyed profile Glen Elgin is famous for. There are lots of different ripe and over-ripe fruits (peaches, pears, mango, banana and more) topped with a honey-toffee syrup and some nuts. Later shy spices join in as do some waxy-oily aromas. No off-note or imbalance that I can find, this is pretty delicate to nose (and impressive, too). The taste repeats the fine flavours of the nose in different layers that are interesting to explore. In addition to these a delicious milk chocolatey flavour pops up in a later wave before the spices grow stronger and counter perfectly the sweet fruity attack (that is very enjoyable throughout the whole tasting experience). Water releases more toffee and herbal aromas in the nose and chalky-mineral and white chocolatey notes on the palate but to be honest: I prefer the neat dram! 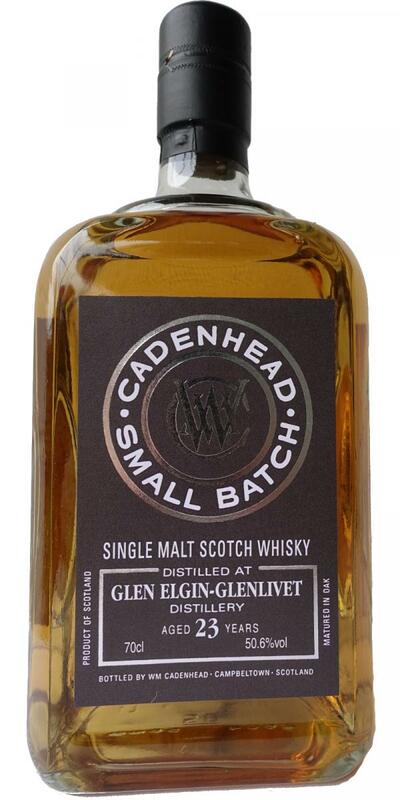 The dram arrives warming with a minor peppery touch on the palate and coats the mouth nicely. The finish is long with more spices (ginger, cardamom) and some fine bitter flavours from the woods (tannins) which provide a tasty counterpoint to the sweet fruits. Hey, this is a great composition of aromas and flavours - I like that! No distracting moments, this dram was bottled at the right time. I had the opportunity to try with a buddy. The brief notes are what I remembered. Very soft ripe and set. Really pleasant and somehow summery. A tropical fruit cocktail with sugar and really creamy, syrupy. In addition a suitable ginger note, which fits perfectly into the picture and sets a pleasant counterpoint to the fruity sweetness. With some time in the glass, the colleague shows his age and you can smell oak wood. Soft, almost tender start. Then immediately comes the tropical fruit candy and bring neat sweetness. Again, the ginger comes along and mixes up the sweetness, creamy thing. Subtle bitterness moves on. But really only very tender. I would say for a while. In the throat area, he is actually gone quickly. There remains only a little ginger and subtle bitterness. But on the cheeks the syrupy, tropical fruit taste sticks, sticking sweetly.